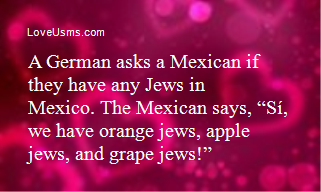 Mexico doesn't win Olympic medals because all the best runners, jumpers, and swimmers are in America. Q: What's the difference between England and a teabag? A: A teabag could stay in the cup for longer. China, Russia, and Poland venture to space. China says they'll go to Pluto because it's the farthest. Russia says they'll go to Jupiter because it's the biggest. Poland says they'll go to the Sun. 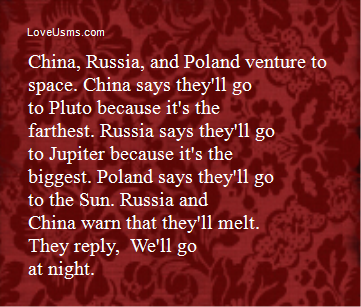 Russia and China warn that they'll melt. They reply, "We'll go at night." Nobody starves in America. People in America die from over eating. So two Irishmen are traveling to Australia. Before they leave home, one of their dads gives them both a bit of advice: "You watch them Aussie cab drivers. They'll rob you blind. Don't you go paying them what they ask. You haggle." 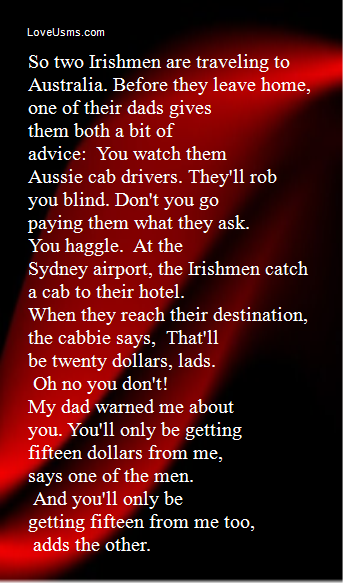 At the Sydney airport, the Irishmen catch a cab to their hotel. When they reach their destination, the cabbie says, "That'll be twenty dollars, lads." "Oh no you don't! My dad warned me about you. You'll only be getting fifteen dollars from me," says one of the men. "And you'll only be getting fifteen from me too," adds the other. Q: What do you call two Mexicans playing basketball? Q: Why is England the wettest country? A: Because so many kings and queens have been reigning there. Q: What’s the best thing about Switzerland? A: I don't know, but the flag is a big plus. A Polish man, a German guy, and an American dude, climb a mountain because they each want to make a wish from the genie on the top. When they make it to the top, they find the lamp and all rub it. The genie appears and says, "For your wish to be granted, you must yell it out while you are jumping off of this mountain." So the German jumps off and yells, "I wish to be a fighter plane!" "So be it," the genie says, and the German becomes a plane. The American jumps off and yells, "I wish to be an eagle!" "So be it," the genie says, and the American becomes an eagle and flies away. The Polish man runs to the edge, accidentally trips on a rock, and yells, "I wish to b- oh S**t!"